Characters who are questioning their sexual or gender identity. Sisters Roz and Eva, a year apart, have always been best friends and confidantes, but suddenly Eva is shutting out Roz, their parents, and her best friend Carmen. Roz is hurt and is looking for reasons for this sudden change in her sister. Both sisters participate in theatre at school, with Eva always winning the main roles. When Roz wins the role of Rosalind in “As You Like It,” she worries that this is the reason Eva is mad. When she discovers Eva has a lesbian novel hidden under her covers, she guesses that Eva is a lesbian and is afraid of coming out. Always the more gregarious and impetuous, Roz, whose (male) crush is dating Eva, decides that girls could be a possibility in her future, and decides to come out to pave the way for Eva. Encountering some unexpected homophobia in the form of name-calling and pranks, even from her sister, Roz plows bravely forward with her new “lifestyle,” and strikes back with pranks and attacks of her own. Mirroring “As You Like It,” Roz and Carmen, and the members of the drama club all seem to be in love with, or have crushes on the wrong people. And as in the play, all is sorted out in the end, with the “real” lesbian(s) standing up, the sisters reunited, and Roz with a surprising new love interest of her own. 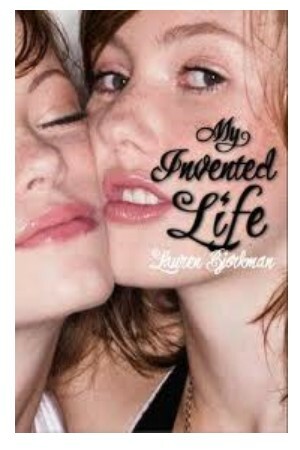 Overlooking the annoying cover photo, this was actually an entertaining light read that teens will enjoy.